Well, you know how it goes â€“ I bought a stack of Easter items to review right after Easter, but then I got lazy. So now Iâ€™m stuck writing about Easter candy while everyone else has moved on to bigger and better things, like the fast-approaching All Candy Expo. But I swear this is my last Easter candy review until next year â€“ unless something interesting comes up at the ACE, of course. Anyway, Canadian chocolatier Laura Secord is another one of those middle-to-high-end chocolate companies like Purdyâ€™s, and itâ€™s known mainly for its chain of mall chocolate shops, but its products are also available in other stores, especially around the big candy holidays. The Secord Egg is Laura Secordâ€™s answer to the Cadbury Creme Egg : a chocolate egg filled with a yellow and white fondant center. (The Secord Egg calls it â€œbutter cream,â€ despite there being neither butter nor cream in the ingredients.) A higher-end Creme Egg? Sign me up! Inside the cheery yellow and lavender box, the egg is wrapped loosely in waxed paper printed with Laura Secord logos. For some reason, thereâ€™s a crumpled little ball of shredded paper in there too â€“ to keep the egg from rattling around and getting all broken, I guess. This is one hefty egg â€“ I estimate itâ€™s at least twice the size of a Cadbury Creme Egg, and heavy to boot. (The Secord Egg comes in at least two sizes, of which this is actually the smaller.) The chocolate is a very thin, crisp layer over an enormous amount of dense, heavy fondant, and itâ€™s not really very good chocolate â€“ it tastes a little stale to boot. Inside, the fondant is very white, shading to yellow in the center. Itâ€™s stringy like caramel and shiny like a very stiff meringue, which is oddly appropriate, except that there are no actual eggs in the ingredients. Like a Creme Egg, the fondant is really, really sweet, but doesnâ€™t really have much flavor of its own, not even vanilla. It just kind of tastes like â€œsweet,â€ like cake frosting, though the textureâ€™s not the same. Creme Eggs have a good balance of chocolate and creme, but here the massive amount of filling dominates, overpowering the small amount of chocolate with its sweet, gooey blandness. If you think Creme Eggs are too sweet, stay far, far away from this. Itâ€™s an awkward candy to eat â€“ Creme Eggs are gooey little sugar bombs, but theyâ€™re small enough that itâ€™s a manageable feat to eat one all at once. The Secord Egg is way too sweet to eat in one sitting, but too messy to easily save some of it for later. And definitely donâ€™t eat this thing before breakfast, like I did (curse my early-morning candy habit!). Now if youâ€™ll excuse me, Iâ€™m off to put some real food in my stomach before the sugar crash hits. Double the size of a creme egg and also sweeter? I think I’ll pass on this one. 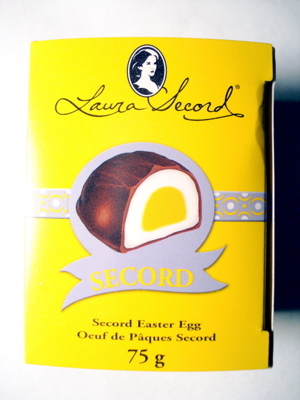 I never ever comment on websites but the Laura Secord eggs are dear to my heart. Laura Secord started producing these eggs, available only at Easter, in the 1920′s so this was most certainly not “an answer” to Cadbury’s anything. The shredded paper is meant to represent a nest… you know, where an egg might be found. I think the “problem” you are having with the size is that they were never meant to be gluttonously gobbler down in one sitting. In my family, at least, they were special Easter treats only, sliced thinly and shared by us all, not mindlessly popped into your Gob while reading the Enquirer at check-out. I agree with Canadian girl, do not try and eat it all at once. At Easter in my house we can not wait for them. As a kid only my Dad would get one as they are a little pricey and I could not wait for him to open it and cut off a piece for me. Now I buy a few at Easter and put them in the freezer. Also you can get a bite size one. Love them!